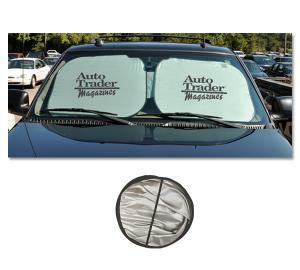 With your firm imprint or logo, our promotional auto accessories, make great promotional items. See our wide choice of auto accessories below. These items will make a big impression to promote your business by advertising with promotional products.. This means that everyone will see the auto accessories with your company imprint or logo, use them, and think of your firm when they need your product or business. It is also a great way to promote a specific event. Lowest price starting at: $4.75 each. Description: Light, reflective material. Held in place with automobile sunvisor. Pops open and folds easily into carry pouch that measures 9-1/2” x 10”. Price Includes Two identical one color silk screened imprints on one side. Lowest price starting at: $10.10 each. 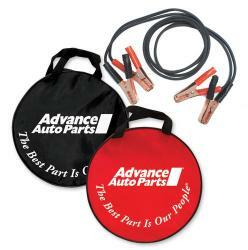 Description: Durable 70 Denier nylon bag holds 8-foot, 10-gauge/200 amp copper booster cables. How-to-use instructions included. Lowest price starting at: $4.61 each. 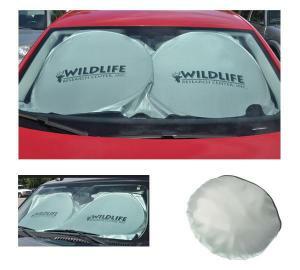 Description: Light, reflective material to keep automobile cool. Easy to open and install. Held in place with automobile sunvisor. Actual size is 27"h x 56-3/16"w. Pops open and folds easily using elastic loop strap. Description: Pressure levels clearly marked on gauge. Handy pocket clip. Sturdy construction.